The blue uniform worn by soldiers in military hospitals was known as the ‘Convalescent Blues’. The uniforms were made of blue flannel lined with white, worn with a white shirt and red tie. They were loose and ill fitting and many patients had to turn up or cuff the trouser legs. Men arrived at the hospital from the front in filthy lice-infested army uniforms, and the Convalescent Blues were an aid to preventing infection and disease. They also identified the wounded soldier as the returning hero. 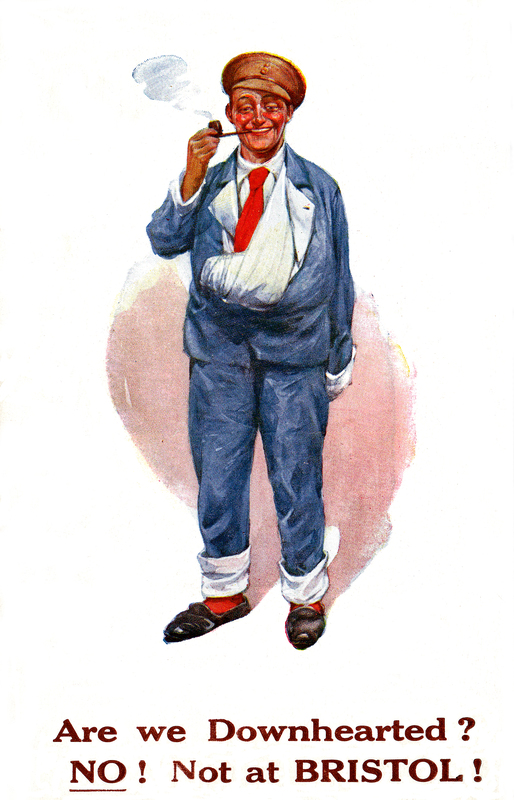 Contemporary postcards featured soldiers in hospital blues as a boost to patriotism and the war effort. The Imperial War Museum has a complete set of Convalescent Blues, but very few outfits have survived. For our exhibition, ‘Postcards from a War Hospital’, we bought white flannel and dyed it to as near a match as possible, and museum volunteer and seamstress Ann Blannin created a replica uniform for display. The artist Frederick Cayley Robinson’s series of paintings, ‘Acts of Mercy’, celebrate the work of Military Hospitals and feature the soldiers in their Convalescent Blues.